Artist Unplugged: A Virgin No More! Hear About It! You will never guess what I did yesterday........it was my first..........um, no, not that! I participated in my very first art festival! Decided at the last minute (Friday afternoon) to go for it. Spent until after midnight finding enough easels and framing four items for it. Wasn't really expecting to sell anything- just needed to take that first step even though I didn't have that many items. Low and behold, the heavens opened up (not with rain, thankfully) and someone purchased two items as I started to pack up! The zentangles, who would have thunk it - she bought the two zentangles below that I had framed. I also met one of my blog friends, she was in the festival as well. Visit her site if you want to see the photo her husband took. http://www.micheleleeart.com/ She does some beautiful work and has a good heart. And that you sold something! HOORAY FOR YOU!!!! I definately say DO MORE! You are so good at these. I'm so happy your first show did so well. Hope you have plans for more. Keep us posted. Oh, and congratulations for becoming a seasoned "art fair artist". CONGRATS!!!!! That is wonderful. It is a good feeling to sell something at a festival isnt it? Your zentangles are WONDERFUL and I do think your friend is right on. I am so happy for you!!! It was really great being able to finally meet you face to face.And I am very happy that you took the plunge. It is always scary the first time...they get easier as you go. 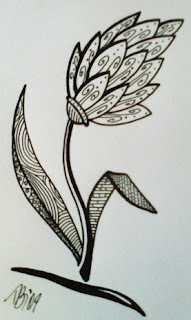 Keep up the Zentangles. this is just sooooo thrilling! i am so proud of you. it takes 'guts' to put yourself out there and risk!!! well done you. and yes do mpre, lots and lots more...do atc cards of them and swap with us!! !go girl go! Congratulations! I know that first big step is hard as I just participanted in my first juried art show! Bravo, take a bow. Lovely work should be seen by as many as possible. Congrats on putting yourself out there, art shows are so much fun to go to but seem like a lot of work for the artists! there's an award over on my blog for you today T.
Why am I not surprised that you sold the zentagles......and guess what? I got a phone call from the woman who actually invented them. She called to order a WrapADoodle! and we got to talking....and so I wound up trading a WrapADoodle for one of her Zentagle kits. So can't wait to try one. I told her about you and your amazing zentangles....btw, did you get the coloring books? Go for it! Again and again! Wonderful news - congratulations on the sales. How exciting! Congratulations. Looked like an inviting table you got. It all looks so wonderful! Congratulations!!!!!!!!!!!!!!!! WoooW! Awesome! I haven't had the nerve to do an art festival. You do such beautiful work!!! I'm so glad you got to share your wonderful art with others! You go gurl! Congratulations on the sale. It's no wonder they sold. They are so pretty. Those zentagles are so cool! Two eleventh-hour sales at your first art festival--an omen of great things to come! I believe they are right! I love those... I did my first one too, a few months ago, it feels liberating doesn't it! I am very happy for you...Let there be many more sales,dear friend! I love your Zentangles! Congrats on your first art fair, I hope it opens the door to many more - and maybe now an Etsy shop is in order!